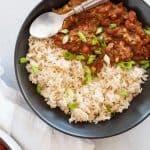 This Vegan Red Beans and Rice recipe may not be traditional (see also: it's vegan), but it certainly is tasty, bold, and easy! It is no secret that I love beans. Beans are nearly a perfect food—full of protein, fiber, and nutrients. Plus, they are incredibly tasty, readily available, and one of the most affordable forms of protein around. You can easily feed a family on $1 worth of beans. Try doing that with meat! Beans and spicy flavor are a match made in heaven. Many of the biggest bean-loving cultures have cuisines that use robust and bold flavors. 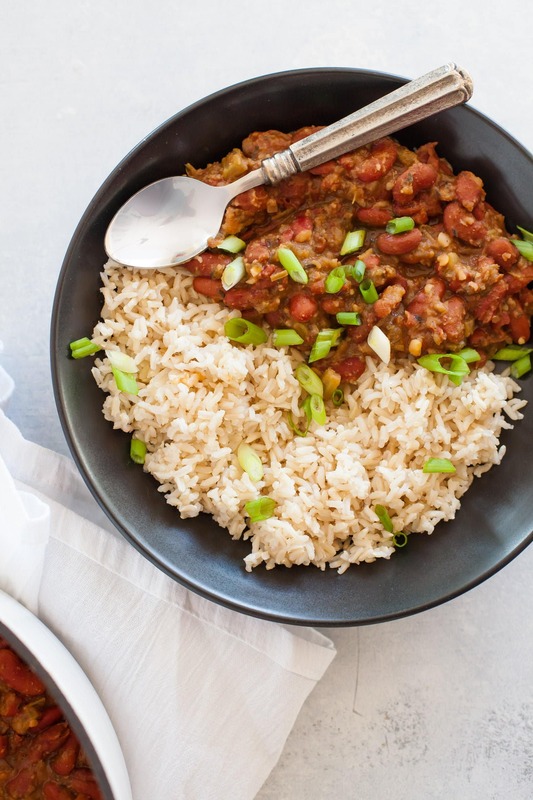 And of these bold-flavored dishes, one of my favorites is red beans and rice. I can’t (even a little) claim to be a Louisiana culture expert, but I do know that what we called “red beans and rice” growing up here in rural Indiana was decidedly not the same stuff you get in Creole country. It was more like a red bean and sausage casserole—delicious, but not the real deal. My first experience with the spicy, beautifully simple flavors of a more authentic red beans and rice was when a Cajun/Creole restaurant opened up in my college town. It was love at first bite! And that restaurant is what I miss most about my college years, even more so than really good delivery pizza! 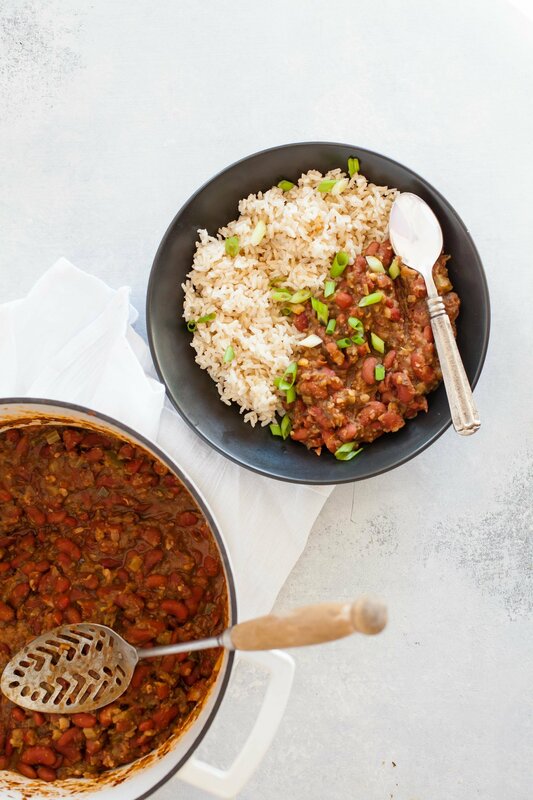 The recipe I’m sharing today is a more authentic take on red beans and rice than what I grew up with (although still not completely, because, a: I made it plant-based and it’s typically…um…not and b: hello, as a born and raised Indiana girl, I don’t have the cultural heritage to make it authentic). Smoked meat (like say, a ham hock leftover from a ham dinner the day before) is a staple of the smoky flavor of traditional red beans and rice. To get that smoky flavor without the meat, I stuck to a genius suggestion from Susan over at Fat Free Vegan Kitchen—use chipotles in adobo sauce. Chipotles in adobo add a great spicy kick and a ton of smoky flavor that really makes this dish taste hearty and meaty without any animal products. It’s pretty easy to track down chipotles in adobo in most supermarkets nowadays—just check the international foods section. 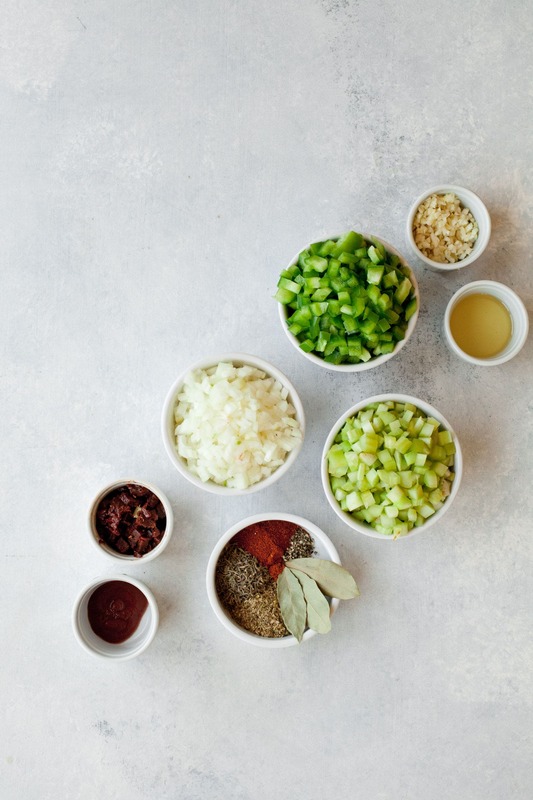 A little goes a long way, and for this recipe, we’ll just use a little from the can—I like to freeze extra peppers (in their sauce) in ice cube trays for future uses. Even if there are some non-traditional elements of this recipe, the texture is spot on. If anything, this dish is more like a bean sauce with rice—which is exactly how red beans and rice are supposed to be. You want to cook the dickens out of those beans until the line between bean and sauce is so fuzzy that you’ve got a big ole pot of creamy, thick, stick-to-your-ribs-y goodness. One final note: when I originally posted this recipe back in 2011, I recommended folks do it in the slow cooker. That’s still a fine method (and I give you instructions on how to do it in the recipe notes), with one important adjustment I neglected to include originally: you must boil your dried kidney beans vigorously on the stove for 10 minutes. This will subsequently kill a toxin (phytohaemagglutinin, AKA: kidney bean lectin) in dry kidney beans that causes some folks digestive issues. Most slow cookers do not get to a high enough temperature to kill the toxin. If you’re sensitive, as few as four undercooked kidney beans can make you feel ill. Some folks (like me) don’t have any issues with the toxin, but others do, so, in my opinion, it isn’t worth the risk to save 10 minutes. Boil those beans! Enjoy. 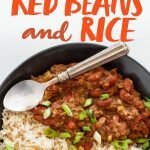 This Vegan Red Beans and Rice recipe may not be traditional (see also: it’s vegan), but it certainly is tasty, bold, and easy! Modified from Fat Free Vegan Kitchen. Heat the oil in a large Dutch oven or stockpot over medium high heat. Add in the onion and cook until very tender and beginning to brown, about 10 minutes. Add in the garlic, celery, and bell pepper, and continue to cook until just softened, about 3 minutes. Add in the soaked and drained kidney beans, bay leaves, thyme, oregano, cayenne pepper, black pepper, chipotle peppers, red pepper sauce, and vegetable broth. Bring to a boil, reduce heat, and simmer for about two hours, or until the beans are very tender and mushy (see notes about bean cooking time). Season with additional salt and hot sauce. Serve with cooked rice and top with sliced green onions. The age of your beans can greatly affect your cooking time. Older beans take longer to soften (and if they are too old, they might never soften to the point you’re looking for). If your beans seem like they’re never going to get to the tender/mushy stage—just go at them with a potato masher. I won’t tell anyone. This dish is supposed to be spicy, but if you’re a heat-wimp, leave out the cayenne pepper and hot sauce to begin with—you can always add more later! Slow Cooker Method: Place the soaked, drained, and rinsed beans in a large stockpot and cover with water. Bring to a boil and boil vigorously for 10 minutes. Drain and rinse. Add to slow cooker with all remaining ingredients (except the rice and green onions) and cook on low for 4-6 hours or high for 6-8, or until the beans are very tender and mushy. Season with additional salt and hot sauce. Serve with cooked rice and top with sliced green onions. Ooh this looks absolutely delicious! My only question… how did you cook your rice? It looks flavorful and interesting! I STRUGGLED with black beans recently never quite getting to the mushy stage I love… and I totally went at them with a masher just to get it done, added water and stirred until reduced to what I wanted. I’m glad I’m not the only one! This looks delicious! Is there a conversion for canned kidney beans instead? I always have the canned ones on hand, but haven’t tried the dry beans yet (due to the fear of the toxin)… Thanks! Made this over the weekend – soooooooo good! I did sub in three cans of beans instead of the bag of dried beans (mostly due to my timing on Saturday and forgetting to start the beans Friday night!). The chipotle peppers really make this meal – such a subtle and wonderful flavor! Hubby loved it, too. The heat was nice and flavorful – not so hot that you couldn’t eat it or it hurt your mouth, but hot enough that it made you a little warm eating it! Sooooooooo good. Hey how long did you cook the canned beans? Im going to use canned beans as well and dont want to overcook them? As a Norwegian, my only experience with red beans and rice was a very under-spiced freeze-dried backpacking meal eaten while camping by Havasu Falls. Even the gorgeous setting (seriously, do an image search for that!) and my very tired feet couldn’t make that dish taste good. But I do love me some chipotles in adobo sauce, so I’m going to give this a shot! I did an image search for Havasu Falls. You’re right. Breathtaking! Oh no! I’m not seeing that email anywhere – try sending it again? I need some of that! Your pictures are mouth watering! Thanks for sharing the detailed recipe and the tips for this dish, it’s useful! I will try to make it. Very nice, but it needed a little something. After looking at other recipes, I added a splash of vinegar and some tomato sauce. It needed quite a bit more hot sauce and we also squeezed on lemon juice at serving. I’m guessing that onion, garlic, and pepper could easily have been increased — perhaps doubled — as well. The texture after 7 hours in a slow cooker was fantastic. It was really worth it to make it from dried beans and very easy in a crock pot. 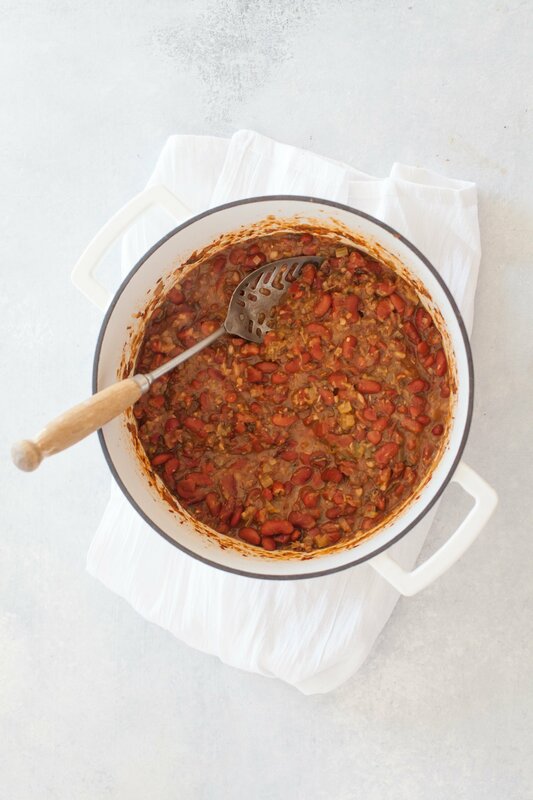 I am always on the lookout for a good bean recipe and this is going to fit the bill! 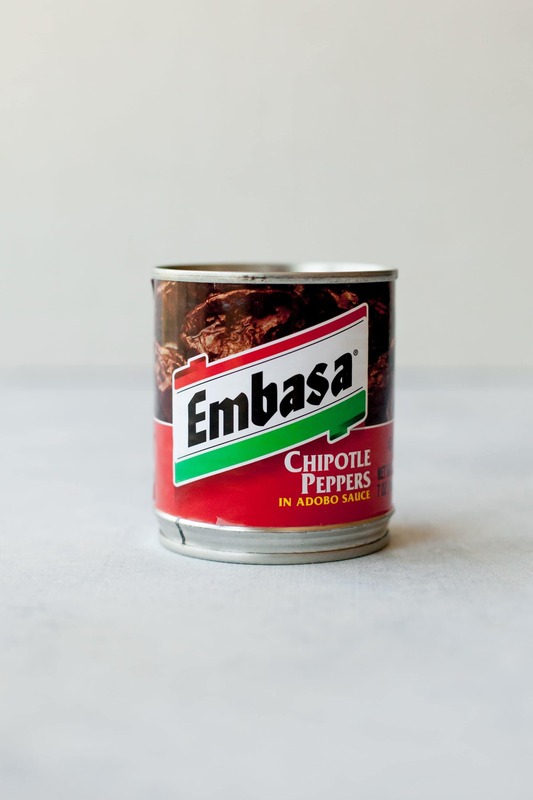 I have a can of chipotles in adobo and hadn’t figured out what I was going to make with them…just picked them up to have them whenever. Guess what I’ll be making tomorrow?!? Thanks so much! P.S. I’m born and raised in Southwest Michigan, so I’ll never know if they aren’t “authentic” or not :) hahahaha!